Now, you’re in the market for the perfect holster to complement your pistol. But how do you choose one? Look no further, because we’re going to give you the low-down on several different types of holsters to meet various gun carry needs. After field testing more than 38 holsters both at home and on the range, our recommendation for the best S&W 642 holster is the IWB Kydex by Concealment Express. The Kydex IWB earns the top spot thanks to its durability, retention, and price. Although it’s uncomfortable for some people to wear inside the pant, it’s still the overall best holster for Smith and Wesson 642 pistols. Before diving in to our reviews of the best SW 642 holsters, let’s get some context for how we chose the winner. 1 What Do You Need In A Holster? What Do You Need In A Holster? First, consider how you intend to carry your new pistol. This gun has no protruding hammer, so it’s a good candidate for concealed carry. You’ll need to determine how you want to carry it: at your side on a belt, in the small of your back, in the waistband (IWB), or on the ankle. 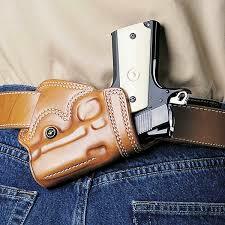 For concealed carry, if you get a belt holster, you’ll have to remember to guarantee coverage. This may mean adding a coat or long-tailed shirt to your wardrobe. Assuming you choose to wear it at your back, consider your driving and work habits; will you be sitting or driving for long periods of time? If so, a Small-of-Back (SOB) holster might not be an ideal choice for you. Holsters in the waistband can work well for some body types, but aren’t a good fit for others. If you choose an ankle holster, ask yourself if you can get the weapon out quickly if the need arises. Also, when talking holsters, you must take into account your dominant handedness. Holsters, for the most part, are either right- or left-handed, but not both, though you may find a few here and there that are ambidextrous. Use caution if ordering online to make sure you’re getting the correct product. Of course, there are also shoulder holsters and inside-the-purse holsters for the woman who wants to carry in their handbag. This may be the best and most versatile option. These come with a belt/waistband clip, slots to slide a belt through, and sometimes both. Wearing the holster on your side gives you the advantage of being able to draw quickly in an emergency. 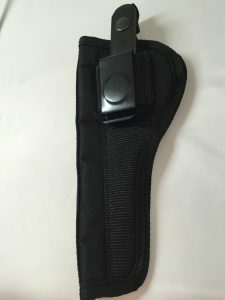 If you get a holster with both clip and slots, you can wear it with or without a belt. This type of holster has lots of possibilities; you can wear it in front or behind your hips or wherever is the most comfortable. 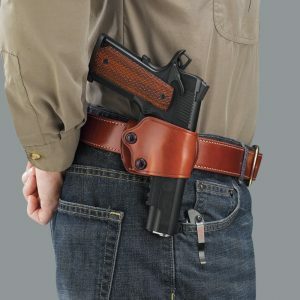 One disadvantage is you must wear a long shirt or jacket if you want to keep a belt holster concealed. Carrying a weapon at the small of your back also provides another benefit: it’s farther away and harder to grab for an assailant facing you. One disadvantage of this kind of holster is it might be uncomfortable if you spend a lot of time in your car or sitting at a desk. Depending on the type of SOB holster, you might also have to wear a jacket to keep it concealed. IWB have become more popular with gun owners recently. They offer the advantage of nearly total concealment and good retention. However, wearing this holster may be uncomfortable for some, and is a little harder to quickly access. When purchasing an IWB holster make sure to pick a holster that fits your body size well. If you’re unsure about what size of IWB holster setup best works for you, we advise picking a general size model. These are the holsters you want for wearing in a boot or around the ankle. Some may prefer to carry this way if they are uncomfortable carrying in their waist, or if they spend a lot of time in the car or at a desk. The big disadvantages to this kind of holster is it can’t be worn with skinny jeans, shorts, or some dresses, and if it’s in the pant leg, it’s difficult to draw quickly. And if you often wear combat boots, a holster that wraps around your ankle (rather than one with a boot clip) wouldn’t be very practical. So, now let’s take a look at some specific holsters for the S&W 642. Because there are so many different types of holsters, we’ve narrowed down the choices to some of the more popular varieties, but also for some of the not-so-standard methods of carry. Each one listed has its good points along with the bad, so you can discover what might work best for you. This Kydex holster is also an in the waistband rig. It’s made by Concealment Express, made of molded Kydex plastic, and is form-fitting to the S&W 642 and 442. You can probably bet a week’s pay it has a tight grip. It’s got adjustments for cant as well as weapon retention. You should get a ‘click’ feedback sound when the firearm is correctly seated in the holster. The clip, though made of plastic, seems thick and strong. This holster may be uncomfortable for some people to wear inside the pant. I used a similar paddle holster on a duty belt, and my bony hips made it difficult to find the sweet spot. You’ll get a lifetime guarantee on this holster. I’ve had a couple holsters made of Kydex, and I’ve never had a problem with one. The fit is nice and tight and can be adjusted if necessary, and I’ve never had one fall out of a holster, even in a full run. This is an in the waistband style holster handmade in the United States and backed by Relentless Tactical’s lifetime guarantee. The suede should make this holster a comfortable rig to wear. It’s got a somewhat generic fit; it’s listed for several different firearms with similar J frames, most of which are Glocks, so it’s not molded 100% to the S&W 642. There may be a little looseness or play in the fit. However, the leather should be more durable than a similar holster made of nylon, and the holster seems to have a sturdy clip. I’ve used a similar holster (a million years ago!) for a mini .25 ACP I carried as a backup, though mine was a generic nylon holster and was not form-fitting. This holster would have been a blessing at the time! In the waistband holsters may not be for all body types, but even if you prefer to wear sweatpants with a little stretch to them, this type of holster would make a good carry option. 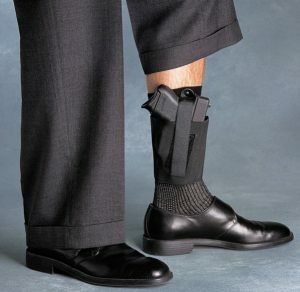 This is for those who prefer or need to carry an ankle holster, whether as a backup or primary deep concealed weapon. 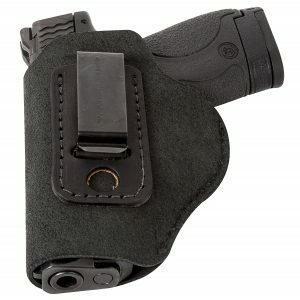 The holster itself is made from saddle leather and is stitched to the velcro-closure neoprene band. It also has an available calf band you can order for extra stability. And with Galco’s patented sheepskin design between the holster and the ankle, it’s incredibly comfortable. If you’re determined to use an ankle holster, the features on this one might be just what you’re looking for. I have no personal experience with an ankle holster, but people I know who choose to carry this way have seemed pleased with their choices in holsters. This holster was designed from the ground up specifically to carry at the small of the back. 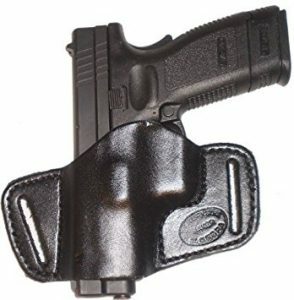 It slips easily onto a belt, can be used by either right- or left-handed people, and is also useful as a cross-carry holster when put up front. It’s somewhat molded, but can be used for other similar frame weapons. There’s no clunky release strap to worry about when drawing, yet the holster should maintain good retention. 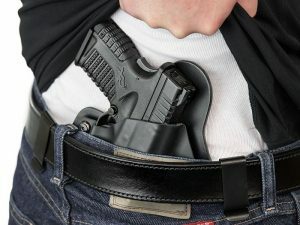 Since this holster is outside the pants, you will have to make sure to add a coat, long shirt, or sweater to your wardrobe, something to keep the weapon covered while out in public. Nylon holsters are some of the cheapest prices you’ll find on holsters. 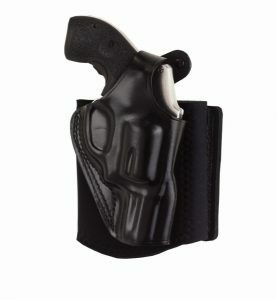 This holster can be used on either the right or left side (the clip is interchangeable as well). The fit of this one is somewhat generic, but it comes with a retaining strap to keep the firearm securely seated. A simple swipe of the thumb when drawing releases the snap. So, now we’ve talked about some of the holsters on the market for your Smith & Wesson 642, and you should have a pretty good idea of what you’re looking for. 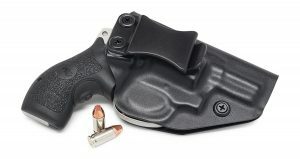 Of the rigs I’ve listed, my choice for best holster would be the IWB Kydex holster from Concealment Express. It’s got quite a few wearing options, good firearm retention (for safety) and similar style holsters come in paddle varieties as well (no need for a belt). I wore a similar (though belt clip variety) for a number of years on duty, and I found it was one of the most durable types of holster I’d come across. This was hard use, too. I was often in a car, taking my seatbelt off and putting it on repeatedly, scraping against the car door or frame, and constantly drawing and replacing my pistol in the holster. 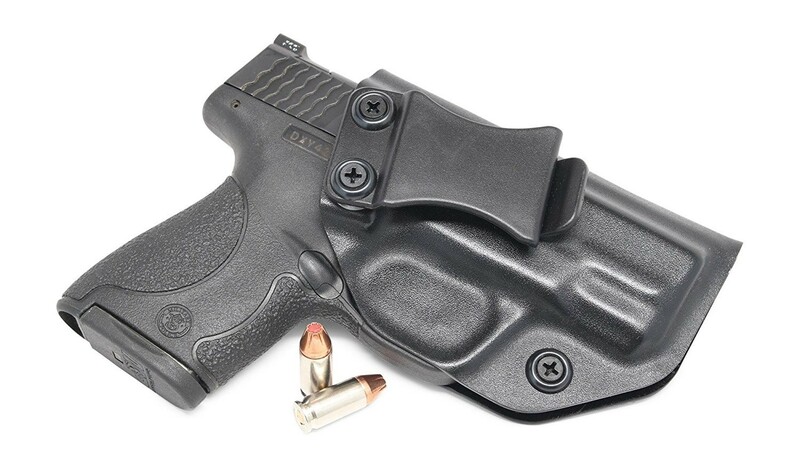 This holster is a good buy for the price, and you should end up with a strong, durable rig. In fact, I still have mine. For ease of drawing, durability, retention, and price, the Kydex holster seems to be the clear winner. Great review of the 642 options. I prefer using a leather holster (bigger around the mid-section), which is more comfortable when I sit down. Kydex/synthetic tends to chafe after a few sit-downs / stand-ups. The best S&W 642 holster on the market today.